The spine characterizing this family is blue, as is the mouth, and both stand out against the yellow background. The black patch on the caudal fin of the young disappears in adults. 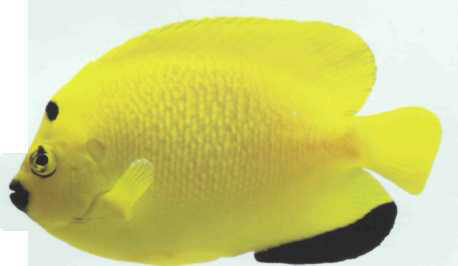 The flagfin angelfish appreciates a vegetable component in its diet. It is a vigorous swimmer which needs a large tank. Size: 25 cm.